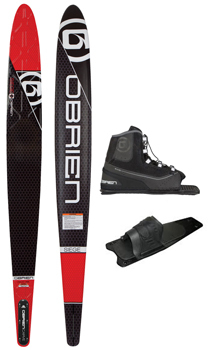 The O'Brien Siege is a streamlined ski designed for speed and stability. This is the same shape as O'Brien's popular and formerly top of the line, Sixam 2.0. With a tunnel concave, edge changes are effortless and the ski turns on a dime. A softer flex and increased rocker make this ski feel stable right out of the box. Adjustable A.R.C. Fin with Forward and back adjustment. The rocker creates smooth transitions from edge to edge. Quick, easy edge changes and amazing tracking with a tunnel concave. Smaller, defined bevels means a faster, easier turning ski. Mike says "This one of the best ski values on the market!" Front lace system for easy entry and exit.